While more conventional art can be tucked neatly away on gallery walls, houses have a much larger footprint. And when a home outlives its most basic function of providing shelter, a decision has to be made as to whether it is ultimately worth saving. Modernist homes like those designed by Paul Rudolph face an additional challenge as products of a stark, concrete-laden brutalist style now seen by many to be cold and uninviting. Photographer Chris Mottalini visited three abandoned Rudolph homes awaiting demolition. His photos present these onetime symbols of opulence and power at their most vulnerable and defeated. Rich, full-color photos show sunlight playing across shattered windows, dusty stairs, and ruined living rooms, presenting a view of modernism that few have seen before. The photos speak to the ephemeral nature of contemporary taste, and its uneasy relationship with history, as well as the consequences of modernism on our visual lexicon. And in a final coda, the pictures themselves serve to preserve these masterpieces long after time and tastes move on. "Offers an unsparing look at these once-elegant dwellings, capturing peeling paint and broken windows (including one that was smashed while the photographer was on a lunch break). Mottalini’s images are the antithesis of traditional architectural photographs, which make buildings look as glamorous as possible. . . . Mottalini’s photographs reveal both a deep affection for their subjects and a sense of resignation about their demise." "A striking book. . . . The images read like portraits of neglect and speak volumes about the way society forgets historically important buildings in favor of the newest thing." 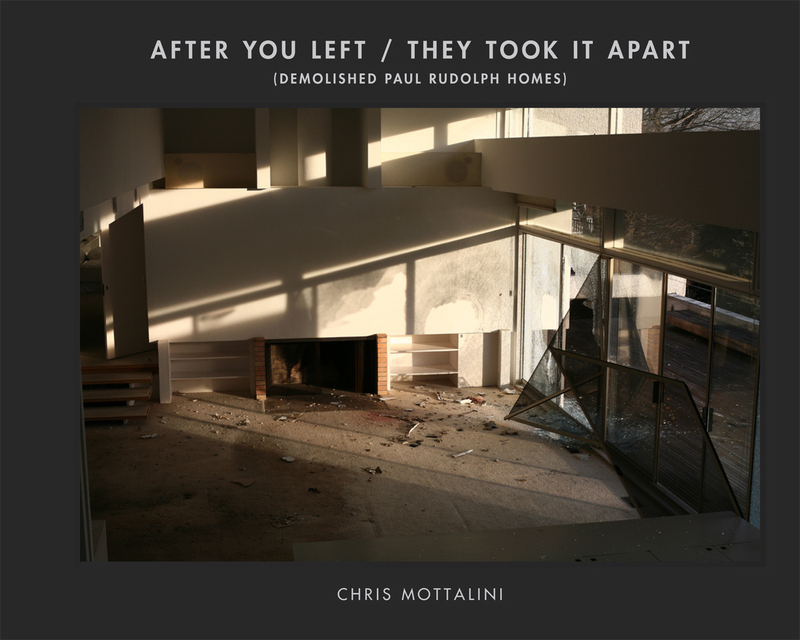 "Poignant, but not nostalgic, Mottalini’s photographs of Rudolph’s ruined houses make us think about how we regard the recent past." "Through Mottalini’s photographs, a new generation is getting to know Paul Rudolph’s legacy while coming to terms with its endangerment. A certain kind of vintage American aesthetic is now fetishized, but the demolition of Rudolph’s homes proves that we have a long way to go in preserving his brand of dominant, near-Brutalist, mid-century modernism."